I cannot believe that it’s nearly December and it’s so hot. You know, coming from Europe we are not used to having this temperatures and what’s even more shocking for me is to see all the Christmas decorations already up, when we heading towards summer. I grew up associating Christmas with winter, as it should be, haha. But I think I will get used to not having to wear tonnes of clothes, a coat, gloves, etc. A few times I have talked to my family over the phone, they have told me it’s very cold in Madrid, with temperatures as low as -2 in the city centre. And here we are, in beautiful and tropical CAIRNS, enjoying the beach and the swimming pool every day, as you can see in the photos. The first photo was taken in our swimming pool, probably around 9 oclock in the morning. 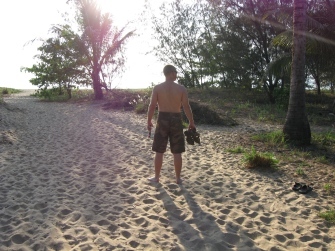 And the second one is the entrance to the beach closest to our home in YORKEYS KNOB. It’s less than one minute away. We cannot complain, can we? Every weekend we visit Rusty’s Markets, where we buy fruit and veggies for the whole week. We’re trying to have a very healthy diet and, following the Australian Government advice, eat five portions of fruits and veggies each day. So every morning we enjoy a delicious fruit salad, a fantastic way to start the day. Well, in Rusty’s Markets all the produce comes directly from the farms and some times it’s the actual farmers who are behind the stalls. Many families are Asian, but we have also met some Spanish people, Cubans, French and Colombians with their own stall. 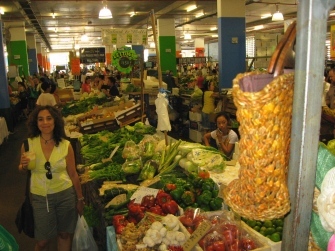 As you can see, the place is very cosmopolitan and it is always very interesting to discover new tropical products. A shame there’re so many things we don’t even know how to cook. I must admit coming to Rusty’s to do our grocery shopping is one of my hobbies as every time I discover new veggies I had never seen before. 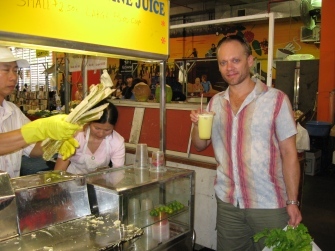 And yesterday we also tried sugar cane juice. Absolutely delicious and soooooo refreshing!!! In my last blog I promised that I was going to tell you who Harold Holt was. Harold Holt was an Australian politician who became the 17th Prime Minister of Australia in 1966. Until here, nothing really unusual, is it? Many countries all over the world have a Prime Minister. But Harold Holt is better known because his term as Prime Minister was dramatically ended in December of the following year when he disappeared while swimming near Melbourne and was presumed drowned, but the body was never found. Basically, he went for a swim with some friends and never came back. The theories concerning his disapearance are many. Some say he was murdered because he opposed to the American bases in Australia, some said he committed suicide, but my favourite theory is that there was a Chinese submarine waiting for him and now he would be, in case he was still alive, living happily in China. Why would the Chinese be waiting for him? Because he would be a spy. True or false, it makes politics a bit more interesting.